PULITZER PRIZE FINALIST • NATIONAL BOOK AWARD FINALIST • Hailed by The Washington Post as “mandatory reading,” and praised by Fareed Zakaria as “intelligent, compassionate, and revealing,” a powerful journey to help bridge one of the greatest divides shaping our world today. 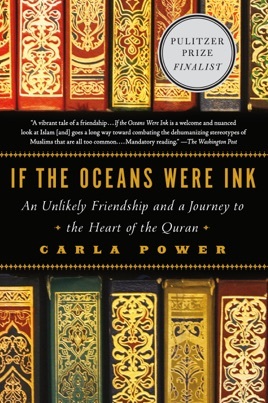 If the Oceans Were Ink is Carla Power's eye-opening story of how she and her longtime friend Sheikh Mohammad Akram Nadwi found a way to confront ugly stereotypes and persistent misperceptions that were cleaving their communities. Their friendship-between a secular American and a madrasa-trained sheikh-had always seemed unlikely, but now they were frustrated and bewildered by the battles being fought in their names. Both knew that a close look at the Quran would reveal a faith that preached peace and not mass murder; respect for women and not oppression. And so they embarked on a yearlong journey through the controversial text. A journalist who grew up in the Midwest and the Middle East, Power offers her unique vantage point on the Quran's most provocative verses as she debates with Akram at cafes, family gatherings, and packed lecture halls, conversations filled with both good humor and powerful insights. Their story takes them to madrasas in India and pilgrimage sites in Mecca, as they encounter politicians and jihadis, feminist activists and conservative scholars. Armed with a new understanding of each other's worldviews, Power and Akram offer eye-opening perspectives, destroy long-held myths, and reveal startling connections between worlds that have seemed hopelessly divided for far too long. In this engaging memoir, Power, who was a foreign correspondent for Newsweek, recounts the year she devoted to studying the Qur'an with Sheikh Akram, a friend and former colleague from Oxford. Recently, the Sheikh's scholarship, which "challenges bigots of all types," has found a much wider audience. His work of 10 years, compiled in a 40-volume treatise, details the historical contributions of thousands of women scholars to Islamic literature, back to the time of the Prophet. Power attended both public lessons and one-on-one discussions with the Sheikh. She spent time with his family in Britain and traveled to the village in India where he grew up, in an effort to understand how his family implemented the Qur'an's teachings into their daily lives. Power and the Sheikh touch on historical and contemporary topics, especially in respect to women's rights. Together they explore homosexuality, Muhammad's wife who operated a caravan business in Mecca, the significance of veiling and unveiling, the struggle against unjust rulers and jihad, and contemporary wars. Power's narrative offers an accessible and enlightening route into a topic fraught with misunderstanding. The book has interesting insight and details about Islam, but the author isn't critical enough of her mentor. Rather than trying to synthesize her own experiences with his beliefs, she denigrates her own while accepting his. With her constant drumbeat of "Islam does not equal culture," the book becomes repetitive. Furthermore, she doesn't place her mentor enough within Islam as a whole, because his interpretation seems non-standard. A comparison with Christianity and its various strands (i.e., following Jesus' pro-poor strand vs. using the bible to justify capitalism) would be a valuable addition. Overall, worth reading but a disappointment in its lack of nuance.